Note: I updated this blog post in November 2018 to give you more guidance and resources. In all my books and teachings, including on this blog, I have an important mission that guides everything I do. I want to help you crack open to a spiritual relationship of your own understanding so that you can serve the world, attract your greatest desires and live with a strong faith that will support you at all times! One of the most awesome to deepen your spiritual connection, no matter where you are on your spiritual journey, is to free-write after meditating. Free-writing is also known as stream-of-consciousness writing. When we free-write, we don’t edit ourselves. We don’t question any of the words that come through for us. Instead, we simply write it all down. Free-writing is a really cool way to ignite your creativity, and many authors turn to it when they want to bust out of their routines and let ideas flow. It’s also my favorite way to amp up my meditations! Watch the video below or keep reading to learn why free-writing after meditating is so powerful, and to get my guidance on how to practice it. In meditation we connect to an energetic source. You might also think of this as your intuition or inner guidance system. When we meditate we slow down our breathing, quiet our conscious minds and become very receptive to spiritual guidance. When we come out of meditation, many of us want to go and grab our phone, jump right back into work or otherwise do something that takes us out of that connected, meditative space. But after meditating I like to take advantage of being in that ~ing zone, or inner guidance zone, which is a concept I talk about in my book Add More ~ing to Your Life. While I’m still in this meditative, spiritually connected place, I open my journal and free-write for at least five or 10 minutes after I meditate. Free-writing lets us make the most of the clear, connected and intuitive space we’re in after meditating. Inspired, creative and beautiful messages often come through while free-writing following a meditation. 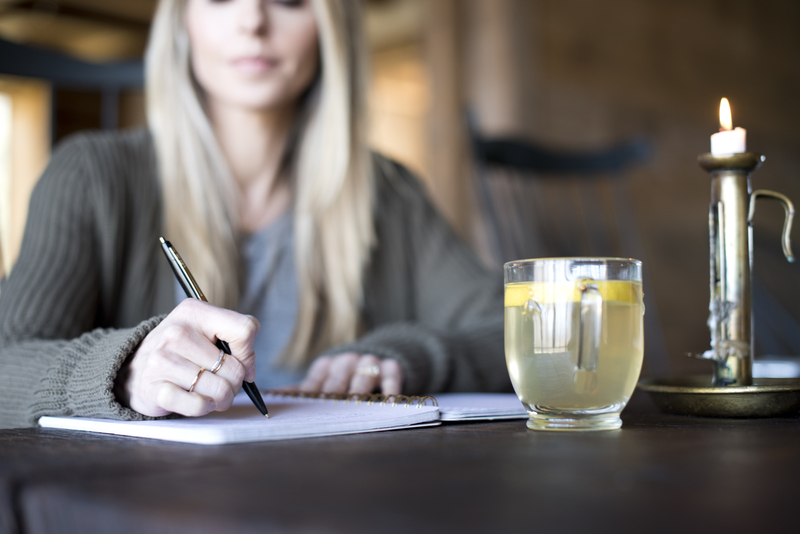 After you sit in meditation and access a place of stillness, even if it’s just for a couple of minutes, pick up your pen and let the words flow in a journal. Before I begin free-writing I write at the top of the page, “Thank you, guidance of the highest truth and compassion.” When we call on inner wisdom or a voice of spiritual guidance, we want to be conscious to call in a voice that is the most loving, kind and compassionate. What you’re doing is aligning with source energy through your meditation and then bringing that energy onto the page. Check out my guided Journaling Meditation! I made a new Journaling Meditation to help guide you into alignment with the Universe before you begin your journaling process. All you have to do is press play and let the inspiration flow onto the page. The meditation is free when you order The Universe Has Your Back Journal! You can download it instantly here. You may start channeling while free-writing! You may find when you start to free-write that your pen moves very quickly, or that words come onto the page that aren’t even your own. This is called channeling and it’s very cool. You are free-writing through the voice of your intuition and writing down the messages you are channeling! Trust that voice and trust those messages. What if you feel stuck? If you feel stuck and feel resistant to the process, just write. Let your pen flow and don’t overthink it. Overthinking is what creates resistance. Just get all the ideas onto the page without judging them, even if they aren’t what you expected. Don’t edit yourself, either. If you need to begin by writing the same thing over and over, then that’s totally fine. You might write, “I have no idea what to write but I welcome any ideas that come forward,” until something does! Whatever thoughts come into your mind, don’t question them. Just write them down. The more you write, the more your resistance will melt away. While I believe that writing by hand is most powerful if you’re able, you can also type! If the biggest block for you when it comes to free-writing or journaling is that you don’t like writing by hand, just open a document on your computer and type. This can be especially helpful when the messages are coming to you really quickly. When you’re done free-writing, read what you’ve written. Underline anything that feels particularly intuitive or inspiring to you. Take in the messages you’ve received and take them seriously. Free-writing is a truly powerful way to connect with spirit, so trust that you’re receiving the messages you need. The more you practice free-writing after your meditations, the easier it will become. If you want more guidance, my books Add More ~ing to Your Life and The Universe Has Your Back have the most free-writing exercises. 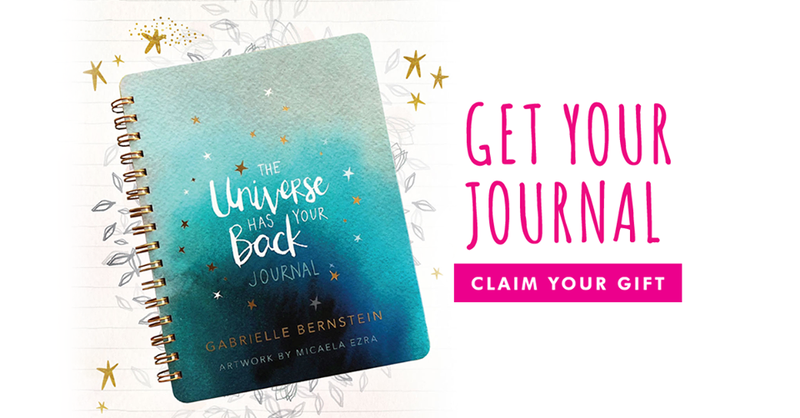 Start free-writing with The Universe Has Your Back Journal! 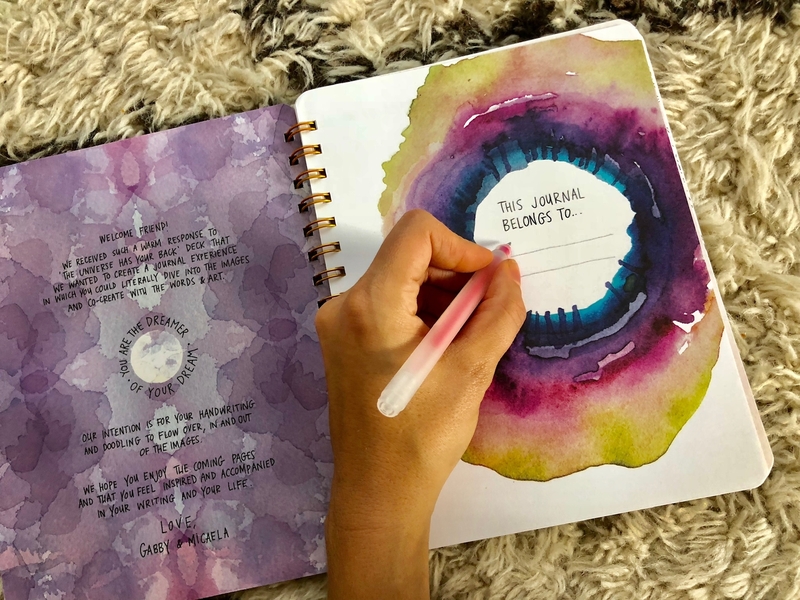 The Universe Has Your Back Journal makes it easy for you to enhance your intuition and deepen your spiritual connection with devoted time for inner reflection. I love this spiral-bound journal because you can open it flat for easy writing. And it’s beautiful! 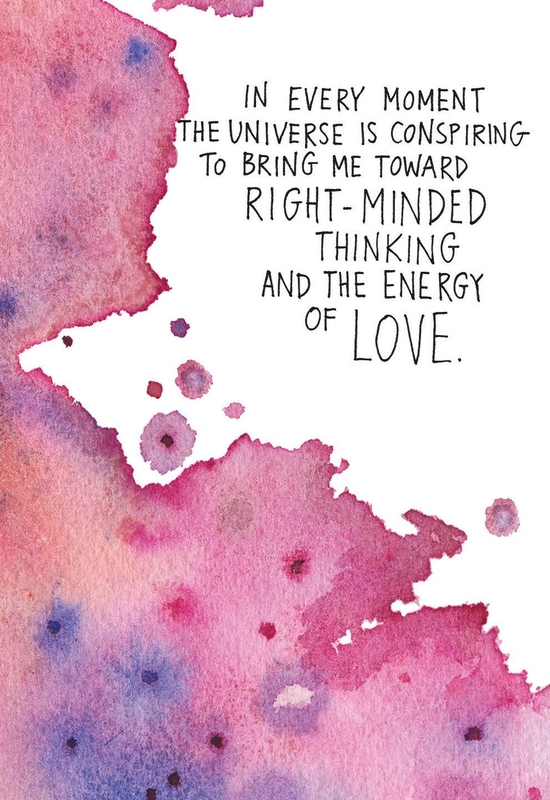 The watercolor designs and mantras from the book will inspire you as you free-write, holding space for your dreams and helping you manifest your greatest desires. Order your journal now and get your free Journaling Meditation instantly! Thank you for all that you do Gabrielle. I’m currently working through your book May Cause Miracles for a 2nd time and really taking all of it very seriously this time. (I half-a$$ed it the first time and STILL noticed shifts!) I’ve been struggling with the notion of abundance lately and through your work and the work of Neale Donald Waslch I’ve come to finally finally finally understand that true abundance is about who you are BEING and not about what you are DOING. This was solidified for me further today after I watched this video and started to add this writing to the May Cause Mirales work that I’m doing and it felt amazing to hear, see, write, and then read that I’m on the right track at the very least. Again, thank you so much for all of your sharing, it’s not possible to explain how helpful and needed it is. Love to you and yours. I am so psyched it served you! I have just been reading amJulia Cameron’s the Artists way – and Thai is exactly what I was reading about – a free flowing writing exercise! although I do journal and have done this after my mediation and I am going to commit to this practice so I can hopefully remove some of the blocks in my creatively and Ernest flow and also get more insights! Thanks ! I’m on the 2nd reading of the Universe has your Back (with HUGE GRATITUDE!!) and finding that it is a “living” read simular to alot of the Big Book for me…meaning it has different and profound meaning depending on where “I’m at” in life. You have inspired me to start so many new things in my life to include a Combat Veteran Yoga class for the Vets in my PTSD program! Its a slow start…but I freakin LOVE IT and I’m not giving up! My next venture is the Kundalini aspect of it all…so again Thank You! You call out several meditations and prayers in your book. Would you happen to have some sort of quick reference to that material. I’m a recovered Alcoholic so I want what I want when I want it! !…lol…I’m a horrible reader and have your book on audio which makes it even more difficult to go back and reference all that awesome stuff. If not, no worries. It may be easier to go purchase the hard copy…just wanted to check. Go to gabbybernstein.com/universe to access all the guided meditations in the book. Do you really type? Does that not disconnect you? I love journaling but find when I start typing I get into my head too much…. However, my hand often cramps from writing…. Thoughts? Advice? Thanks! Would love to do it on the computer, but not sure how to stay connected to my spiritual side and out of my cerebral side. Those words are beautiful, by the way. Thank you so much for this post. I free-wrote after my meditation practice today, and I was amazed at the clarity I found. Like, actually amazed. I plan on making it an essential part of my day! Thank you again! I love your suggestion of staying in the meditation zone with free writing. I asked for guidance in my meditation today and while I haven’t received an answer yet, it felt wonderful to get still and then reflect on paper. The first thing that came to mind upon reflection was remembering the beautiful souls who perished on this day 16 years ago. I just came out of alcohol addiction, and find meditation really helpful. Everything was dark and grim a month ago, but after starting free writing the words that came to me every time… amazing. The words are soothing me: “Addiction doesn’t serve me. There is nothing to be afraid of.” Every time. Thank you for all the love and light, looking forward for your next book <3 You started my journey back to life. Thank you so much for this email today Gabby! It was the exact medicine I needed. I’ve been building an online health coaching program & although I’m really excited about it, I have been in such a rut the past couple of weeks. After I received your email, I watched your video and decided to try this out. I went straight to my meditation area with a notebook & pen. After meditating for a while, I opened my notebook and this is what flowed out, “Love is all that is. Love yourself. Believe in yourself. Love others. Hear their stories. Listen. Teach. Heal.” And right after, my pen didn’t stop. I continued writing for 20 minutes and once I completed I had an entire visual meditation written down. The crazy thing is I’ve been trying to record meditations for my online program and haven’t managed to finish a single one. This truly is a miracle! Thanks SO much Gabby! Hi Gabby – A year ago, I began free-writing after I read The Universe Has Your Back. It has been a complete game changer for me. For decades I avoided any writing /journaling. I told myself I was too impatient/busy and that it was a pointlessly indulgent use of time. I even have journals–which I plan to burn btw–from when I was as young as 9, which I literally marked up with negative self-talk immediately after writing them (comments like –“you’re so stupid!” “duh!” “he’ll never like you!” etc. etc.). But after I read your book and began meditating and free-writing, with a little help from a complete spiritual breakdown ;), I realized my resistance and all the judgment and negativity weaved into my childhood journals was reflective of my disconnection from Source at a very young age. Now, I always write post meditation and it’s been incredibly healing. It reminds me that I’m supported and loved and that I am Light. So big thank you (again)! This is powerful stuff! I was in the midst of a quarter life crisis not knowing what my purpose was in terms of career. I was really unfulfilled and anxious and at time depressed. I was just existing like a robot in the rat race. After doing your meditation then writing for 10 minutes there were things that showed up on the paper from my subconscious that amazed me! Like writing as a passion. I completely forgot I used to write as a teen. If you had asked me as the stressed adult I was “would you like to write a book” I would have not thought much of it but seeing it come through on that bit of paper just unlocked something in me and now I’m writing my first book 🙂 hopefully hay house will pick it up too lol. Thank you for this weightless moment. Just listened to your talk on the Self-Awareness Summit, meditated and then free wrote about the experience. Was thrilled to see this as a blog post. Looking forward to listening to your audiobooks and hearing more of what you have to share. Thank you and take care. How indebted I am to you for your books, your work, your LIGHT! I’m so pleased to watch this video about writing after I meditate. I firmly believe that is where we mine for gold. We are most connected the Source. The mind is still, the heart is open. I’m thrilled that he and I are on this spiritual “writing” path together…we each keep our own journal, doing our own meditation and writing on the short spiritual concept…I’m finding that the insights go deep, the awareness we gain is a treasure. We write ten minutes in the morning, and then again at night, ten minutes or gratitude and reflection on the lessons. I have ordered your GORGEOUS deck of cards you just created, can hardly WAIT to receive them! Works of art, they are! Also, ordered “Altered Traits” (so excited about the history of those two authors, as I’m a big fan of meditation and if Ram Dass….his book Be Here Now changed my life at 21, and I became a scholar of world religions at UCSB. Simply adore you Gabby, hope to someday make your acquaintance. You are lovely on a thousand levels. Namaste!!! I’m so happy to hear that these practices have served you and that you’ve experienced so many miraculous shifts. Trust in the healing path and more will come. Sending you love + light. Life is beautiful. Life is full of light. I woke up and wrote , and im so happy. A long long time ago, I was told to work on my automatic writing as a kind of meditation and universe awareness practice. I didn’t. I wish I did but its not too late! Oddly it was on my mind the other day. And here I am reading exactly what I needed to read this morning. Much love. yet each returns, time and again to the Source. A seed of evolutionary possibility. To become more than one has been. Unfurl your wings….it is time to fly. Fly into the realm of all possibility. Embrace life, for life embraces you. The essence of Love runs through you. We will catch you, every time. I had a profound meditation this morning around a key Course in Miracles workbook lesson 162 I am as God crested me. Afterwards I eventually checked my phone and there was this post from you. I found a piece of paper and the words flowed as an extension of the meditation. Grateful for you and all of us. Thank you babe…for being YOU! PS… I now make all my clients journal often but writing after meditation & before sleep is something I am going to start doing now..